Are you looking for an effective yoga workout to boost flexibility and tone your body? Fortunately, we have something to offer you! We would like to show you a yoga stretching workout, which offers a gentle flexibility routine that is good for relaxation and after a tough training routine. It lasts only ten minutes, so it can be good for busy people. 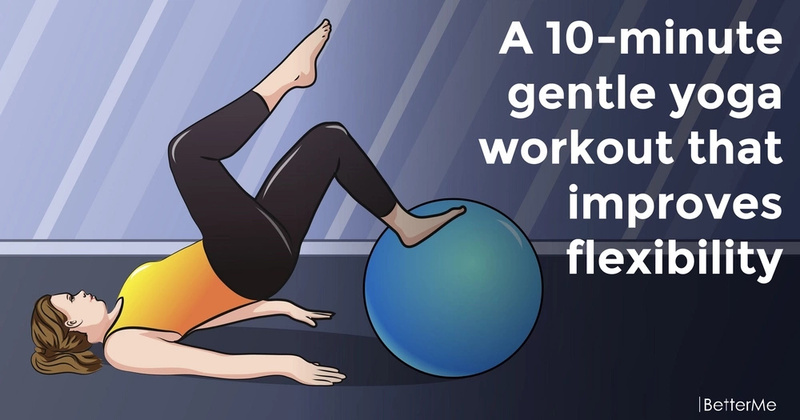 In order to start this practice, you need to find a stability ball, a mat and a resistance bend. A stability ball will support your body and help find a balance. Are you interested? 1. Perform downward facing dog and upward facing dog for five-eight repetitions. 2. Hold downward dog with leg lift to lunge stretch for five breaths. 3. Hold high lunge to warrior II and side angle for three breaths on each side. 4. Hold a side child's pose for twenty breaths. 5. Hold a hip stretch for twenty seconds and repeat on the other side. 6. Hold a lying quad stretch for twenty seconds. 7. Hold a whole body stretch for five breaths. 8. Hold a chest stretch for twenty seconds and repeat it three times. Before you start this yoga practice, you need to warm up your body for several minutes. In order to get noticeable results, perform this workout at least three times a week. Are you ready to start? Scroll down to see how to do these poses correctly to prevent bone and joint injuries. Let’s get it started, ladies!